Born of the High Altitude Pseudo Satellite (HAPS) program, Airbus’s Zephyr is a refined design, with much of the R&D centered on the aircraft’s battery-management technology. Airbus Defence and Space has started production of the solar-powered, high-altitude Zephyr S unmanned aerial system (UAS) at a facility just outside the airfield perimeter at TAG Farnborough Airport. While the UK Ministry of Defence is the launch customer, for three of the long-endurance UASs, Airbus has also secured a first commercial customer. “The Zephyr S is demonstrably years ahead of any comparable system,” said Dirk Hoke, CEO of Airbus Defence and Space. According to the company, Zephyr “endures like a satellite, focuses like an aircraft, and is cheaper than both.” Development of this High-Altitude Pseudo Satellite (HAPS) was started in Farnborough by QinetiQ 16 years ago and Airbus bought the program in 2013. Since then, it has invested heavily to refine the design, and especially the battery-management technology. The “strings" of battery cells must provide energy to the payload during the day, while simultaneously being recharged to enable overnight flight. Currently, Zephyr S has a 25-meter wingspan and weighs less than 70 kg/154 pounds (30-kg/66-pound structure, 30-kg/66-pound battery, and 10-kg/22-pound payload). A larger, twin-tailed Zephyr T version under development will weigh 140 kg/308 pounds. Operating altitude is 65,000 to 70,000 feet. 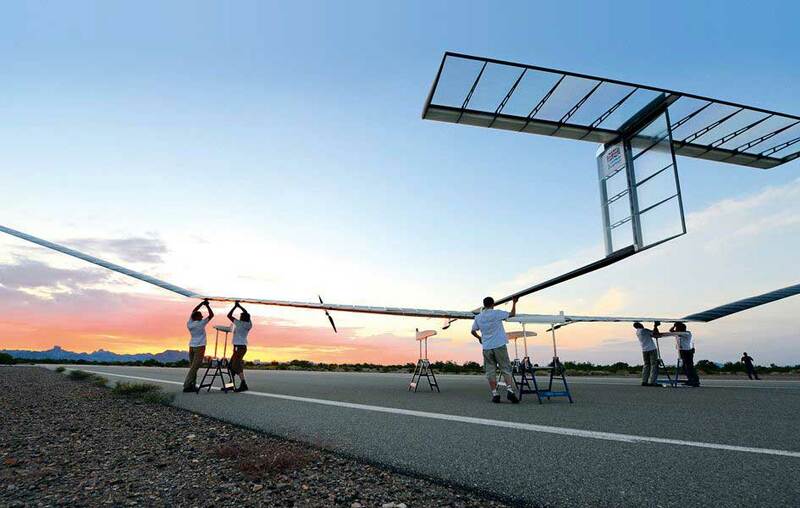 The first Zephyr S is currently on its maiden flight from a base in Arizona and can be followed in real-time this week at Airbus's chalet (K8) at the Farnborough Airshow. The predecessor Zephyr 7 development version already holds the world endurance record for a UAV, set in 2010 at﻿ 14 days 22 minutes. Airbus might be trying to beat that, since it said the Zephyr can theoretically fly for up to 120 days, although 30 days is the typical envisioned duration. Key applications of the Zephyr S are surveillance and communications relay. In the production facility, Airbus is showing a Spider radar payload for Zephyr S weighing 5 kg/11 pounds for ship-detection, location and tracking, and a larger multi-mode imaging radar named Marlin that weighs 20 kg/44 pounds and could be carried by Zephyr T.
QinetiQ is showing a software-defined multi-function LIDAR (SDML), and an automatic track, locate and rebroadcast (ATLR) payload for "red force" tracking, command, and control, and communications rebroadcast. UAV Vision is showing small EO/IR sensor balls. SatixFy is showing a broadband multi-beam communications system that offers 30 Gbps of data speed.